The Markets continued to remain volatile as it ended the second day in a row with modest losses after positive opening. Keeping in line with its behaviour over previous session, the Markets saw a positive opening and formed its intraday high of 8356.45 in the very early minutes of the trade. The Markets soon came off its highs in the morning trade as it trade flat later on. However, in the early afternoon trade, the Markets gave up further as it dipped into the red. It saw a sharp decline in the levels as it went on to form the day’s low of 8236.65, coming off nearly 90-odd points from the high point of the day. After trading in a range near the low point of the day, the Markets saw a equally sharp recovery from the lower levels. The volatile behaviour continued and the Markets finally settled the day at 8277.55, posting a net loss of 21.85 points or 0.26% while forming a lower top and lower bottom on the Daily Bar Charts. The analysis for the day continues to remain much on similar lines as of last two sessions. The levels of 50-DMA have continued to resist the pullback and the Markets are consolidating around these levels. Expect the Markets to see a modestly lower to flat opening and look for directions. With the intraday trajectory remaining important, its behaviour vis-à-vis the levels of 50-DMA would continue to remain crucial. 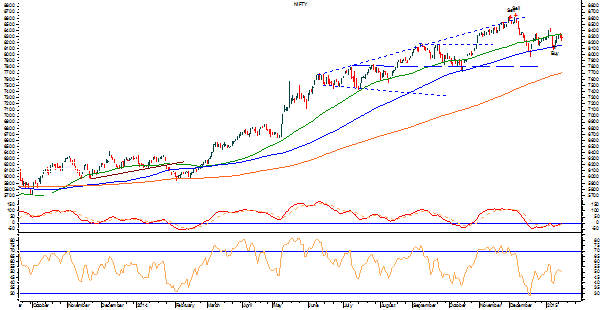 The levels of 8340, which is the 50-DMA for the Markets followed by 8395 would act as immediate resistance. It would find support at 8235 and 8210 levels. The RSI—Relative Strength Index on the Daily Chart is 50.2125 and it remains neutral while it shows no bullish or bearish divergence or failure swings. The Daily MACD continue to remain bullish as it trades above its signal line. On the derivative front, NIFTY January futures have shed over 4.06 lakh shares or 2.26% in Open Interest. This springs some caution as the Markets are witnessing more of short covering than buying from lower levels. While having a look at pattern analysis, the Markets have continued to resist at 50-DMA levels and for any pullback to successfully continue, it will have to move past this level at the earliest. Until this happens we will continue to see the Markets behaving in this fashion with volatility remaining ingrained in it. Overall, the Markets will continue to remain volatile. For it to resume it pullback, it will have to move past the level of 50-DMA which is 8340 with volumes and good amount of participation. Though the downside remains limited, caution still need to be exercised while making selective purchases. Continuance of cautious outlook is advised for the day.